As harmonically complex as a Denisov or Noda piece and as technically brilliant as a Parker piece. Charles Evans has captured a sonic haiku and shared it with us all. It’s not hard to hear why Charles Evans can be seen as a great talent on the baritone. His airy tone only hints at the power he can unleash at a moments notice. His use of large intervalic leaps, micro-tones, extended range, and dynamic contrast which rolls and sweeps across the tracks is evident of his musical mastery. This album is very introspective and emotional. Unfortunately I don’t have liner notes as I purchased the album digitally. In listening to the the selection I can’t help but wonder if his liner notes offer insight into his moving and complex compositions. This album is avante garde and not quite danceable though with enough confidence any wiggle to the music could be seen as dance. Evans has an audience friendly avante garde style which is similar to players like Sax Rivers or Eric Dolphy. This isn’t the type of album that I would play on the stereo to get my significant other “in the mood”. No, this kind of music has always been more cerebral to me and requires a fair amount of dedication to the musicians and their efforts. It’s this humble authors opinion that you have to have a relationship with the music and take it on its own terms to really enjoy the magic of it. You don’t have to have a Phd. in music theory to “get it”, you just need to really listen to it. Evans’ baritone tone on this album is restrained and quite conservative in large sections. You can hear the restraint in his playing. I believe this adds a tension that when released is like an explosion and a great sense of relief for the listener. The venue in which they recorded the album adds greatly to the tone we hear in the recording. The listening space is large and the microphone placement allows for the bass frequencies in his low notes to develop as well as allowing the mid-tones to reflect back to the microphone. The space and or the microphone does seem to lack some of the high frequency which could add more sparkle to his great performance. Evans is not at it alone on this album. To say he is accompanied by Neil Shah is to minimize the relationship. 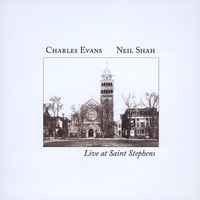 Shah on piano offers counter point and a base from which Evans can express himself. Shah’s light touch and awareness keeps each piece alive and moving. It is very clear that these two musicians must share a great trust and respect as there are large swaths of time in which the players seem to move organically between and around each other and complete each others lines. TAKE AWAY: This is a worthy purchase if you like poetry, avante garde or music to think to. But if you find that this isn’t your cup of tea then it still has loads of value as an example of expressive bari and sensitive piano playing.